There are three major factors I think we need to look at when we consider the economic risk level of a country as a whole. Each of these incorporates many subfactors, of course, but at a high level, they give us a sense of just how much risk an economy, like Russia’s, faces in times of crisis. By this, I mean how much of the country’s economy depends on trade with other countries. (Exports are the primary concern, as imports are covered in the next factor.) A subfactor here is how much of the exports are manufactured goods, as opposed to commodities. Manufactured goods represent added value, while commodities are valued on a production-cost basis, exposing the producer much more to swings in world markets. Compare an iPhone with a barrel of oil, for example. Russia, in this case, is a very open economy in that it depends on exports of oil—a commodity. With these two vulnerabilities reinforcing each other, it’s no surprise that Russia is suffering from the oil price slide. This is a problem without a solution until oil prices rise again. Russia just has to sit back and take it. Can a country dependent on outside resources continue to operate normally when those resources are scarce? The U.S. certainly faced this dilemma in the 1973 oil crisis. Europe did, too, when Russia cut off gas supplies through the Ukraine over the past several years. And now Russia may be facing a similar problem in the form of a shortfall of external capital. 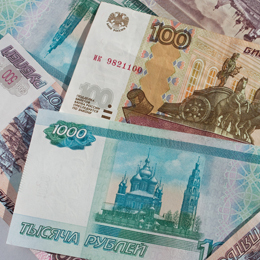 According to the Wall Street Journal, Russian companies owe foreign lenders hundreds of billions more than they can repay—and the government probably doesn’t have the money to cover the gap. Shortages of needed goods can lead to crisis. Given properly functioning capital markets and enough credibility, governments can borrow and spend freely, up to a point. Once that point is passed, for whatever reason, the government’s ability to respond collapses, and the market takes over. With limited financial reserves and multiple claims on those reserves (see factor #2), Russia can’t spend to revive its economy or to mitigate the damage of low oil prices. With sanctions in place, the government can’t borrow either. Russia has now hit its limits and will have to take whatever the market dictates. The final factor in this analysis, which emerges from the previous three, is the currency of the country. For the reasons we've just discussed, the ruble is in free fall. What will this mean, and what will Russia do? The answer to that question is poised to become the most important geopolitical issue in 2015.